His Highness the Emir Sheikh Tamim bin Hamad al-Thani and Russian President Vladimir Putin discussed ways to strengthen bilateral co-operation in several fields, including defence, energy, economy, investment, trade exchange and scientific research at a meeting in Moscow on Monday. The two leaders also explored means to boost co-operation in the organisation of the World Cup and the exchange of expertise, especially as Russia is to host the FIFA tournament this year and Qatar in 2022. The Emir and the Russian president also discussed various regional and international issues of common interest. The talks were held during the meeting between the two leaders on Monday at the Kremlin Palace. At the beginning of the meeting, the Russian president welcomed the Emir, noting the development of relations between the two countries since the last visit of the Emir to Moscow in 2016. Putin said the two sides are maintaining constant communications and stressed "relations between Qatar and Russia have completed 30 years in 2018," adding that the volume of trade and investment is increasing but it has tremendous scope of further growth. The Emir affirmed that the bilateral relations have developed significantly over the past two years since his last meeting with the Russian president, adding that the two countries' ambitions for co-operation are greater than they are now, considering the strong relations and mutual trust between the two sides. The Emir stressed the need to develop these relations in other areas, especially in the volume of bilateral trade. Sheikh Tamim pointed out the importance of 2018 for Qatar and Russia as it is their common cultural year, praising the great co-operation between the two countries in the field of culture. 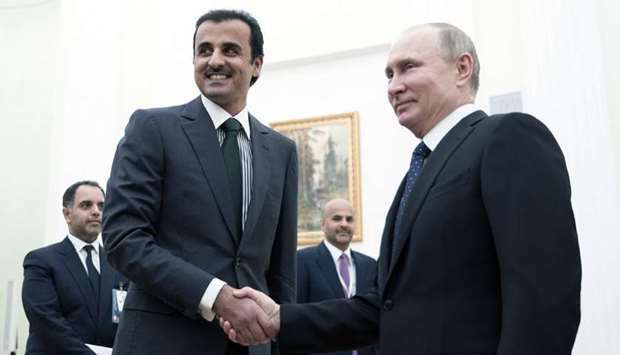 The Emir said Qatar is counting on friends in Russia, considering its historical relations with the Arab world and its role in resolving some issues in the Arab world. The Emir expressed condolences to the president and the Russian people on the loss of many lives in the Kemerovo shopping mall fire and wished the wounded a speedy recovery. The meeting was attended by members of the official delegation accompanying the Emir. On the Russian side it was attended by a number of ministers. His Highness the Emir and the Russian president witnessed the signing of a co-operation agreement in science and education between Qatar Foundation for Education, Science and Community Development (QF) and Rosneft, which aims to open a research centre for Rosneft at the Qatar Science and Technology Park (QSTP). Members of the official delegation accompanying the Emir and a number of Russian ministers and senior officials attended the signing ceremony. His Highness the Emir Sheikh Tamim bin Hamad al-Thani and Russian President Vladimir Putin chairing official talks between Qatar and Russia at the Kremlin. The Emir also met Arkady Dvorkovich, deputy prime minister of the Russian Federation and head of the organising committee of the 2018 World Cup. Held at the Emir's residence in the Russian capital, the meeting reviewed friendship and co-operation ties, and means of enhancing them, particularly in economy and investment. They also discussed Russia's preparations for the 2018 World Cup and prospects of co-operation and exchange of expertise in this regard. The Emir also met with Igor Sechin, chief executive officer of Russian oil firm Rosneft, at the Emir's residence in Moscow. The meeting reviewed co-operation ties and means of boosting them. The Emir visited the Russian national museum for fine art (Tretyakov Gallery). During the visit, the Emir was briefed on a number of historic and contemporary works as well as paintings by Russian artists. The Emir attended a dinner banquet hosted in his honour by the Russian president at the Kremlin Palace. During the banquet, the Emir and the president discussed the results of the work of the Qatari-Russian joint committee for trade, economic and technical co-operation and the prospects of enhancing them, as well as ways to develop military co-operation between the two countries. They also talked about the activities of the Qatar-Russia Cultural Year 2018. A number of ministers and senior officials from the Russian side attended the banquet. After a two-day working visit to Russia, the Emir left Moscow on Monday. 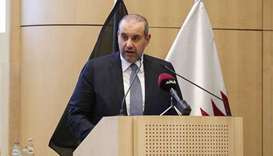 The Emir and the accompanying delegation were seen off upon departure at Vnukovo international airport by Special Presidential Representative for the Middle East, a number of senior Russian officials, Qatar's ambassador to Russia Fahad bin Mohamed al-Attiyah and members of the Qatari embassy in Moscow. The Emir sent cables to President Putin, expressing thanks and appreciation for the warm welcome accorded to him and the delegation accompanying him during the visit. The Emir also expressed pleasure at meeting with the Russian President and the talks, which enabled the two sides to exchange views on various regional and international issues and strengthen the strategic partnership between the two countries. He also expressed appreciation to the Russian President, wishing him good health and happiness and the friendly people of Russia further progress and prosperity.